ConveyUX would like to make the event accessible to those involved in full-time educational pursuits. The options for registration include Complimentary Registration Awards, Poster Presentations, and Reduced Rates. We do not have volunteer opportunities. The rate for full-time students for the conference is $295. Send a copy of a current unofficial transcript to [email protected] We will reply with a promotional code that you can use with the standard conference web site. Blink is offering complimentary registration to ten students for ConveyUX – a value of over $1,200 per student. Any travel expenses are on your own. Students must be enrolled *full-time* at an accredited academic institution at the time the application is submitted. Follow the instructions for the Student Registration Application at the end of this page. In addition, write a description of your vision for the future of the profession. 400-500 words. This can be any aspect of user experience, including specific disciplines, cultural trends, the application of art or technology, etc. Note: Students will be asked to assist with 6 hours of organizational support activities during the conference. The hours will be assigned. It is assumed you will be available during the full three-days of the event. There are just a few spaces available. If interested, send your proposal in as soon as possible. Once the allocated spaces are filled, we won’t be able to accept additional proposals. 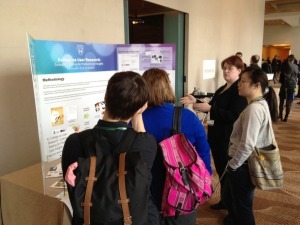 We are accepting proposals for student poster projects for ConveyUX. The poster session takes place during a two-hour period on Thursday, March 1. As a Showcase participant, you would discuss and demonstrate your work. This might include a poster, a demo from your laptop, or the use of physical artifacts. Participants receive a complimentary registration to the conference. This includes access for one person to all sessions and conference resources, food and beverages, and a reception. Additional students can participate using the reduced conference rate. Any travel expenses are on your own. Students must be enrolled *full-time* at an accredited academic institution at the time the proposal is submitted. Fill out the Student Registration Application Form. In addition, write a description of the project of 150-250 words. Include information about the purpose, methodology, and results of the project. If you have already completed a paper or other publication related to your project, please send that as well. In addition to the requirements described above, please submit the following info for us to review.